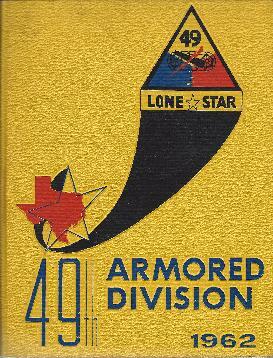 Berlin Wall Crisis 1961-1962 and 49th Armored Division, Texas National Guard. Texas | Columns | They Shoe Horses, Don't They? Periodically, there are documentaries aired relating to events of U.S. involvement preceding, during, and following the Cuban Blockade. Much has been said on �taking down the wall� and the subsequent opening of borders in Berlin. One rarely hears of the Berlin Wall Crisis, a critical time in history in which I was personally involved. 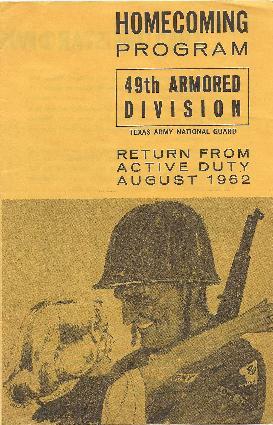 One afternoon in September, 1961, I was en route to my home from work, listening and enjoying programming on the car radio, when an announcer broke in with these words: �The 49th Armored Division, Texas National Guard, has been activated; members report to your Armory for further instructions�. That was a shock to hear! 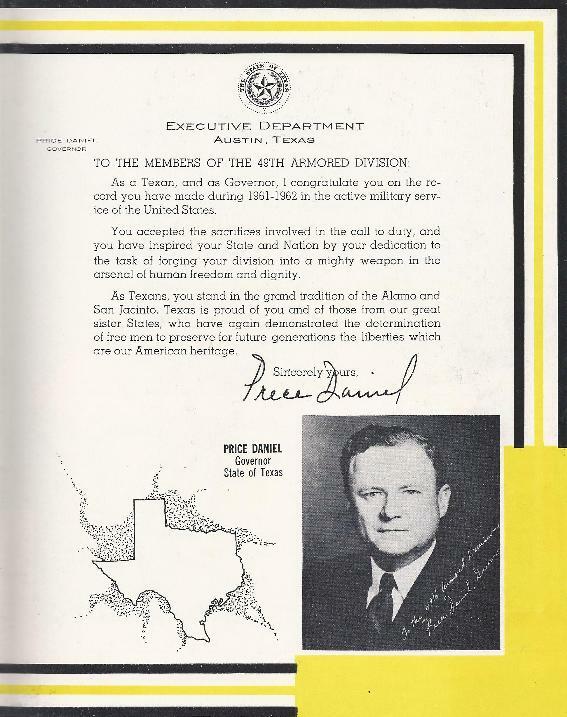 I was a Radio-Teletype Team Chief with Headquarters Company, Combat Command C, 49th Armored Division, Texas Army Reserve National Guard, 4th Army, based in Houston. (That was a mouthful�) Our Armory was located at the Ellington Air Force Base off I-45 towards Galveston. 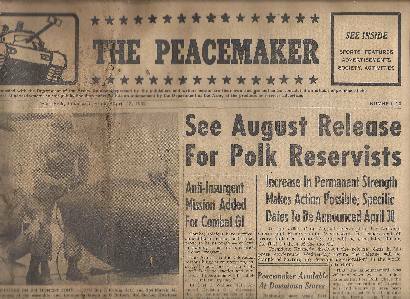 Upon arrival, we were told that we had fifteen days to �clear our calendars� and be prepared to convoy to Ft. Polk, LA. A side-note of irony is that when we were at summer camp in Ft. Hood only two months earlier, the rumors were that we would be activated due to the Cuban Missile Crisis. We �escaped� that rumor and chuckled to ourselves that the 36th Infantry Unit, following us at Summer Camp, would be the ones activated. The Ft. Polk base had been closed and inactive for five years, with only a small portion still open for summer camp use by the Louisiana National Guard. When we arrived, a lot was in disrepair; barracks windows were broken, heating boilers were not fully functional � and here we are approaching the winter months. The first couple of weeks were hectic, to say the least. Supplies had not yet arrived. We went to the local hardware and building supply stores to buy tools, equipment, and materials in order to perform repairs to buildings and the grounds. Once �settled in�, training began to improve readiness in our respective Military Occupational Specialties. Much time was also spent �in the field� on bivouac maneuvers, putting into practice lessons of training. As I am sure occurs with many in numerous military experiences, over time there were humorous moments. 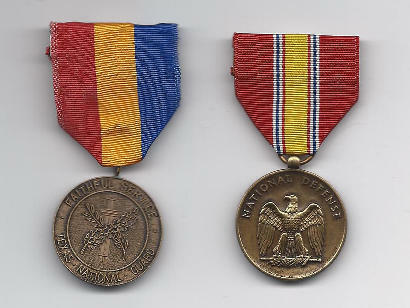 In the field, everyone ate from mess kits; and, going down the chow line, meat was the first served, with vegetables ladled second, and the dessert was last and wound on top of the stack. It was not unusual to eat peaches, potatoes, and meat � in that order. On one occasion, the cooks forgot to pack flour among the provisions and fried chicken was on the menu to be served. The only thing from which a batter could be made was cake mix, Hey, that contains flour; improvise! The pieces of chicken cooked to a golden brown, a great looking crust. But, the meat itself was still raw, because of the crust browning sooner than a normal cooking cycle. During another field exercise, units loaded their equipment on the trucks and proceeded to their designated locations. Upon arrival, our company unloaded everything, set up the command center, hooked up all the equipment and was operational around 11:00 PM. By that time, it was really too late to set up their pup tents, so everyone simply blew up their air mattresses, crawled into their sleeping bags, and hoped for a good nights� sleep. Apparently, someone didn�t check the weather forecast! It began to rain, and it rained, and it rained. Everyone seemingly planned to weather the storm, cocooned up in their sleeping bags. By daybreak, it had rained to the point that air mattresses had floated quite a ways from their original placements on the rolling terrain. One serious moment occurred in the spring of 1962. After the evening meal, an alert was sounded that all Units of the Division were to pack up the base and make-ready for point of debarkation at the Port of New Orleans. By 11:00 PM, all Units had loaded their gear and were in convoy formation, ready to drive out the gates. At that time, the command was given to stand-down and return to quarters. We have no certainty to this day whether it was a �Readiness Alert�; or, whether something ominous was eminent. The 1st Armored Division was already stationed in Germany; the 2nd Armored stationed at Ft. Hood would have been deployed as a second line of defense; and, the 49th would have been the third source of personnel and equipment for replacements during conflict. 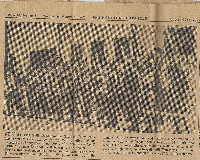 The various Units were comprised of Guardsmen from across the State and maintained as homogenous hometown personnel. The Unit adjacent to ours was from the Rio Grande region with a large number of members being Mexican-American. Mexican food was not on the Army menu schedule; so, our cooks and theirs schemed to trade foodstuffs in order for them to prepare ethnic meals on occasion. 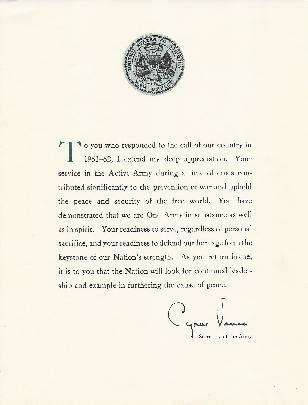 Mexican-Americans in our Unit were often invited as guests to join; and, the �gringos� in their Unit would be our guests. In this black-market exchange, we often got extra servings of steaks! In civilian life, one of our cooks worked in a bakery. He would often spend extra hours at night cooking pastries, cakes, and pies above and beyond the menu schedule. A cloudy issue during the beginning of service was the recall of �regular� Army personnel, with recent discharges, to fill voids in our ranks. The �Why Me� personnel were understandably bitter. Their backgrounds, though, were helpful toward our transition of duties. Over time, these �regulars� and our �weekend warriors� blended; and, some meaningful friendships emerged. Much of the remainder of our tour of duty was rather routine. One of my assignments was to monitor radio and wire service transmissions. In evenings and over weekends, we in the Communications Section could become �hams� over the MARS network. 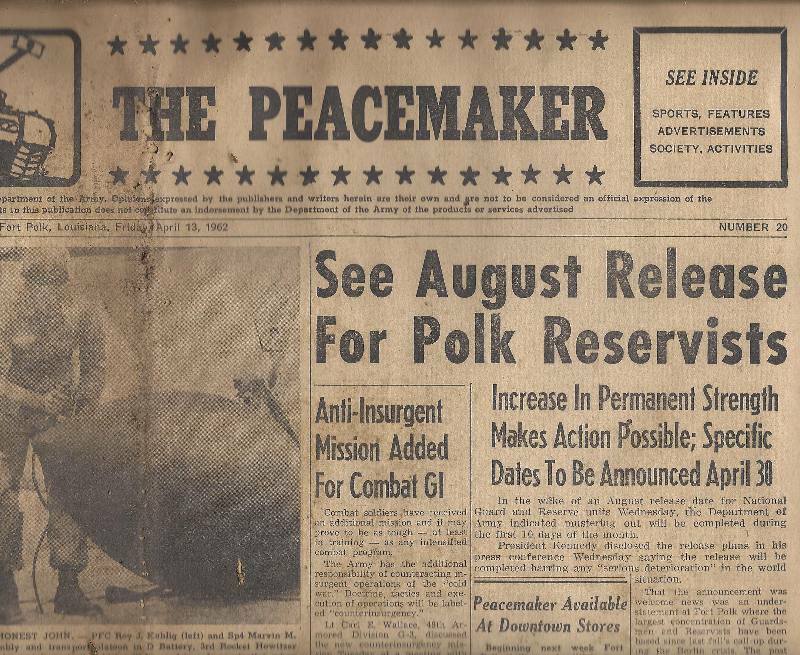 "Published in the interest of the Personnel and their Dependents, Ft. Polk, LA"
In early July, President Kennedy issued orders that our Division, as well as the one called up in Washington State, be returned to inactive status. By mid-August, we were homeward bound. No parades, but it was good to be back home, return to jobs, and restore family and community relationships. 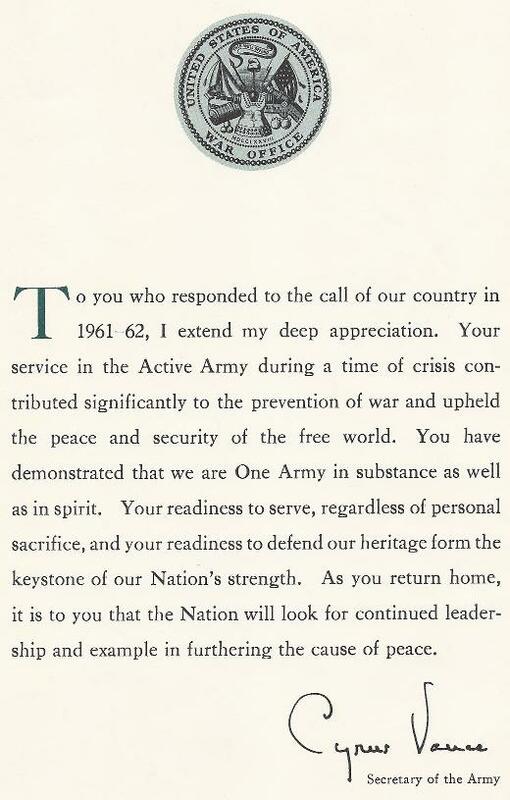 Upon our departure, Ft. Polk was converted into a training base and personnel from Ft. Carson in Colorado Springs, Colorado were transferred as its initial troops who were eventually deployed to Viet Nam duty. HATS OFF FOR THE GUARD  The National Guard came back from Ft. Polk Tuesday, yelling. Yelling with relief and happiness, at being back home. For the 78 members of Co. C, 949th Ordinance Battalion, 250 McCarty, and thousands of Texans, this week means return to families, friends, and jobs. They are pictured shortly after their convoy rolled up to the armory. 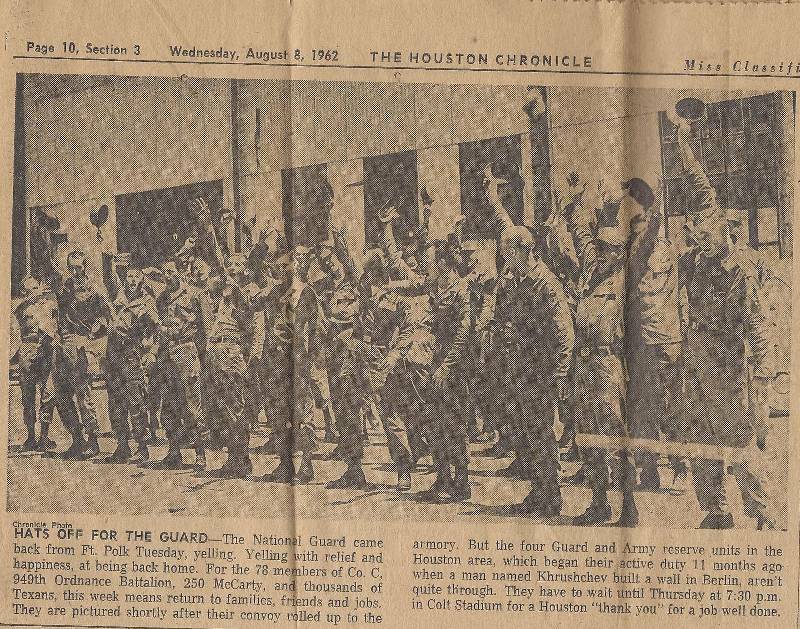 But the four Guard and army reserve units in the Houston area, which began their active duty 11 months ago when a man named Khrushchev built a wall in Berlin, aren't quite through. They have to wait until Thursday at 7:30 p.m. in Colt Stadium for a Houston "thank you" for a job well done. 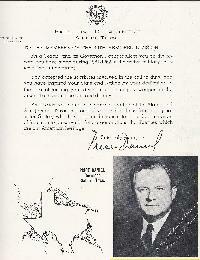 L - "Faithful Service, Texas National Guard"
Subject: "Berlin Wall Crisis 1961"